Note that setting the code access security level to full trust enables the application to call native code, access system services, open database connections and access the registry and modify files outside of the server’s virtual directory. If your hosting provider doesn’t provide full trust, then above code won’t work too. So, you need to find hosting provider that support Full Trust. 1. First, Open your IIS and then go to Application Pool of the chosen web site. 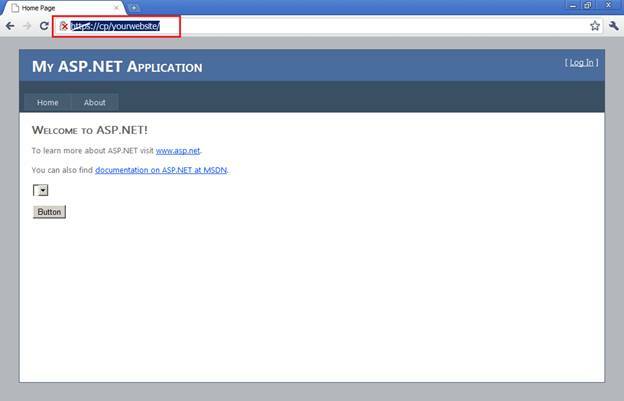 Here in this example the web site name is "test"
Browse the web site and the error would be resolved. 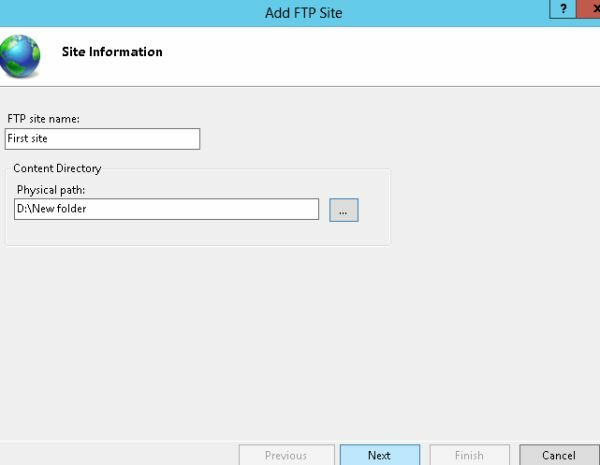 In this article you'll learn the way to add a new FTP site on IIS 8. 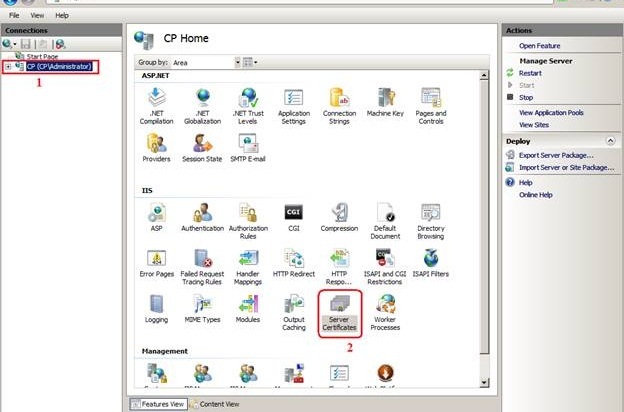 Before going through this article make sure that FTP and IIS are installed on your system. 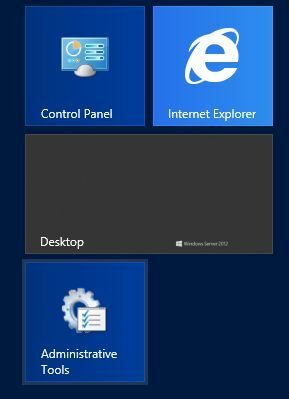 If you wish to find out a way to install IIS then you'll go through this article: Installing IIS. 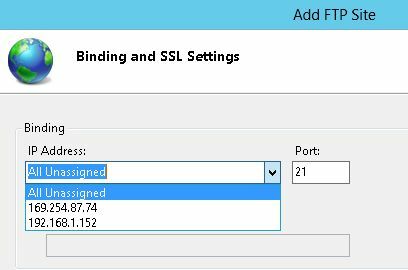 Now allow us to see the procedure needed to add a new FTP site on IIS 8. Step 1. First of all Open the Administrative Tools from the START Menu. 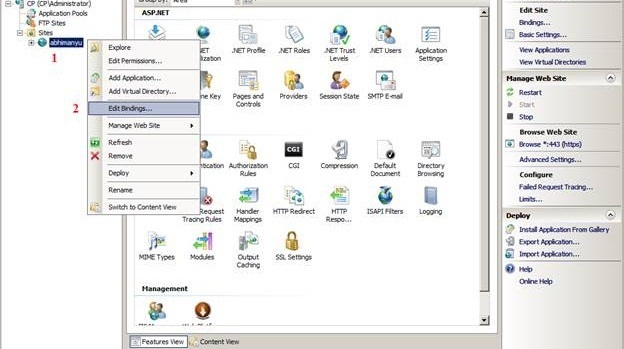 Now within the Administrative Tools, there is several options will be available within the list among that you need to choose the IIS Manager and so double-click on that to open it. Step 2. 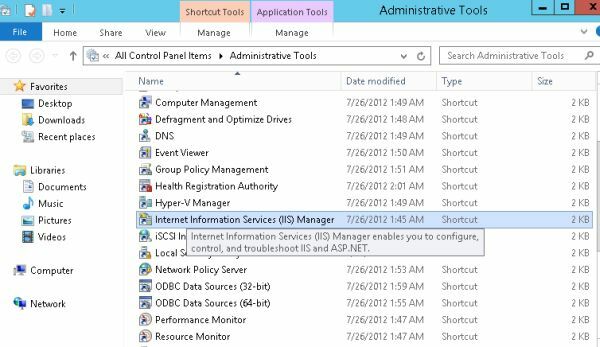 Now the IIS Manager Window are going to be opened. 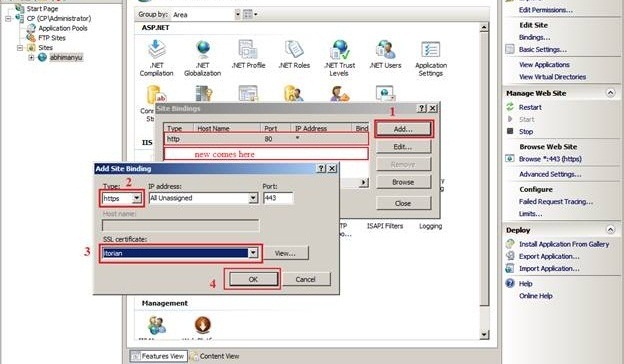 On the left hand side you'll see a pane named Connection Pane, within the Connection Pane a Server node are going to be available, you need to expand this Server node and so right-click on your Server name and so choose the option named Add FTP site. Step 3. A new form are going to be opened. Now you need to give the site information that you just that you aiming to create, 1st give the name for this New site and then give the Physical Path by clicking on the Browse Button. This physical path can verify a folder wherever the Content Directory are going to be created. After select the Name and Physical Path click on the "Next" button. Step 4. Next, named as Binding and SSL Settings. You must fill the IP Address. Click on the drop down Button and so choose the IP Address, if you do not have any IP Address then you'll choose an option available named All Unassigned. After providing the IP Address, give the Port number. Step 5. 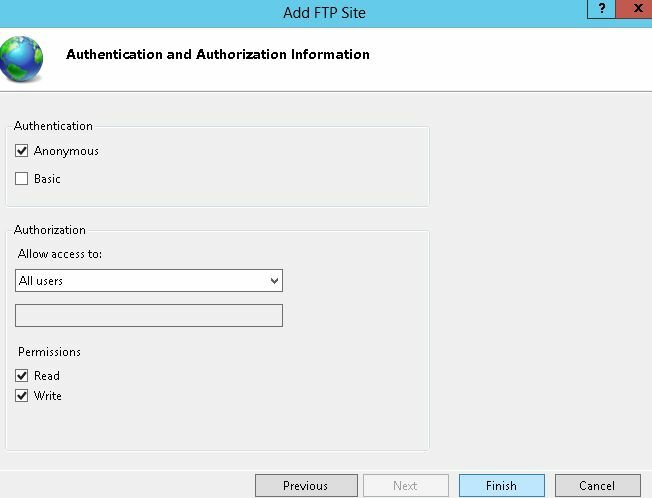 On an equivalent page Uncheck the start FTP site automatically. In SSL 3 options are going to be available, among these choices I selected the third option, in alternative words need SSL and then I give the SSL Certificate. After give all that information click on "Next". Step 6. On the next page Authentication and Authorization is to be provided. On Authentication Permitted if you want to permit all the users then you'll check the "Anonymous" otherwise you'll check the "Basic". In the Authorization I permit all users authorization to Permitted and Write, you'll provide no matter authorization that satisfies your needs. After providing all the information, click on the "Finish" button to create the site. Step 7. Now in the Sites you'll see that the new website is available under the IIS Default web site. 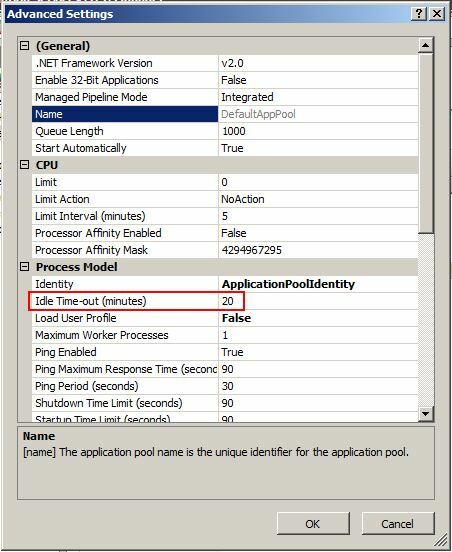 Whether you host in-house or with a managed Windows hosting provider, if you self-administer a web server it's sensible to understand that by default IIS 7.5 sets application pools to “time-out” when twenty minutes of inactivity. therefore if you don’t have a visitor to your website within twenty minutes the application pool can shut down those system resources. 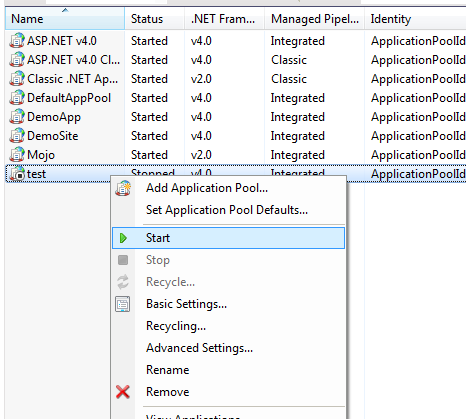 Then the next time a request comes into the site IIS7 can automatically restart the application pool and serve the requested pages. This is an excellent way to preserve resources since each running application pool will place a certain quantity of overhead on the system. But, it conjointly implies that the primary request – the one that causes the application pool to restart – is incredibly slow. it's slow as a result of the method literally must begin, then load the desired assemblies (like .NET) then load the requested pages. betting on the size and complexity of your application, this would possibly simply be a couple of seconds or it'd take 30+ seconds (during which time a user would possible quit and move on to a different site). If you wish to increase the length of the time-out setting, simply change it from the default of twenty to however several minutes you wish. you can also modify the setting to zero (zero) which effectively disables the timeout so the application pool can never shut down due to being idle. To make this change, open Server Manager; Expand the Roles node; Expand the web Server (IIS) node. 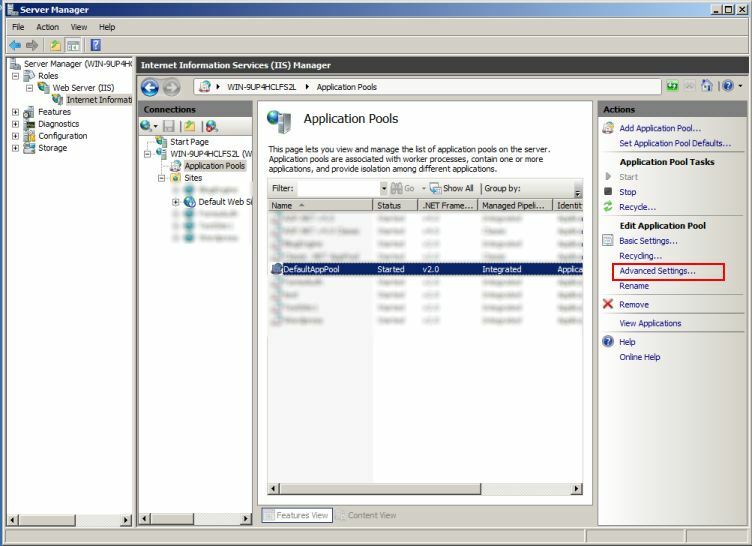 Then click on the web Server (IIS) node; Expand the node along with your local server name; and click on the application Pools icon. You’ll then see a list of the application pools that are defined on your server. within the right-hand pane you’ll see an option for Advanced Settings -> click that. Once you see the Advanced Settings dialog box simply look for the Idle Time-out (minutes) property; click wherever the default “20″ is, and change it to no matter value you prefer. This is only 1 of the many settings that may impact the performance, uptime, and functioning of your web site. If you don’t have the time or interest in learning and maintaining the various settings for a secure high-performing web server, you would possibly need to consider a totally managed windows hosting solution and let a trained and experienced administrator take care of the work for you. SSL (Secure Socket Layer) is a cryptographic protocol developed by Netscape to supply communications security on the net. cryptographic technology uses 2 keys to encrypt data, one for public (public key) and another for recipient (secret key). SSL enabled websites communicate with a web server employing a security channel (secret key) that prevents tempering, eavesdropping (or merely say hacking). SSL is presumably used for a login section, payment system, on-line banking industry etc that's very sensitive info for a company or person. after we enable SSL for a web site the address can begin with "https://" (indicating hypertext Transfer Protocol Secure) rather than "http://". 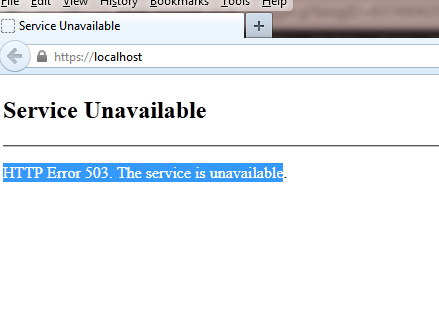 To test this, you ought to have IIS installed. there's no need for further software like Visual Studio or any other web site development kit because only one hypertext markup language file can be tested. Follow the steps to enable SSL on Windows Server 2012 operating system; another operational System may have a slight distinction. 1. 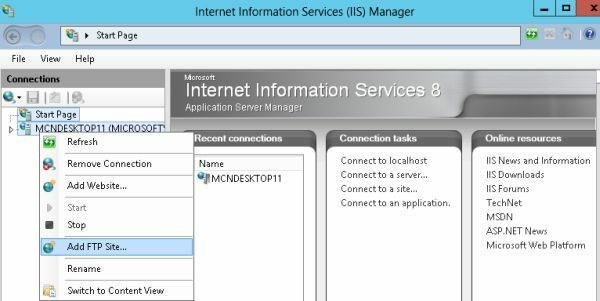 Open the IIS Manager and choose root computer name -> and double click on "Server Certifications". look at the image given below. 2. Now within the window that seems you'll find "Server Certificates" that are already installed. No problem if another one already exists, I recommend to delete all by choosing each and build a new one. If you're not using your system to host an expert web site then, delete all. Look at the correct panel; you'll find "Create Self-Signed Certificate"; click on it. You'll be prompted to enter the friendly name for SSL and click on OK button. 3. After clicking on the OK button you'll realize a new SSL entry. Currently navigate to "Site List" and right-click on that to choose the "Edit Binding" option. Consider the image given below. 4. When you click on "Edit Binding", you'll get a new window requesting a protocol type. There is also 3 or four items, in my example there's only 1 by default that's "http". No downside if you've got many more. at least one ought to be there. now click on the "Add" button and within the window that appears choose the "Type" to "https" and "SSL Certificate" to "yourSSLname". after you are done, i recommend to delete all other protocol types, only keep https. shut the little window listing protocols at the end. 5. Now everything is configured and enabled for you. Let's take a look at it. Please note I only have the only protocol "https". Since browsers by default use http you've got to use here https while requesting via browser. HostForLIFE.eu, a leading Windows web hosting provider with innovative technology solutions and a dedicated professional services team, today announced the support for PrestaShop 1.6 Hosting plan due to high demand of PrestaShop 1.6 users in Europe. HostForLIFE.eu hosts its servers in top class data centers that is located in Amsterdam, London and Seattle (US) to guarantee 99.9% network uptime. All data center feature redundancies in network connectivity, power, HVAC, security, and fire suppression. All hosting plans from HostForLIFE.eu include 24×7 support and 30 days money back guarantee. PrestaShop 1.6 is a free and open-source e-commerce web application, committed to providing the best shopping cart experience for both merchants and customers. It is written in PHP, is highly customizable, supports all the major payment services, is translated in many languages and localized for many countries, is fully responsive (both front- and back-office), etc. PrestaShop 1.6 offers new and improved navigation elements making navigating your online shop easier and more effective than ever. PrestaShop 1.6 presents a comprehensive, intuitive user administration panel, and gives you hundreds of standard functions that can be adapted or personalized in order to respond to all of customer needs. The front office template on PrestaShop 1.6 is now mobile responsive, allowing customer online shop to display perfectly when accessed from a mobile and tablet device. At the forefront of the latest innovative web technology, PrestaShop 1.6 integrates with Bootstrap 3.0, FontAwesome, Sass Compass and D3 Data Driven Documents. Online Shopping has never been so technologically brilliant. A unique e-commerce feature you will only find in PrestaShop 1.6, Net Profit Margin is automatically updated in real-time. HostForLIFE.eu is awarded Top No#1 SPOTLIGHT Recommended Hosting Partner by Microsoft (see http://www.microsoft.com/web/hosting/HostingProvider/Details/953). Their service is ranked the highest top #1 spot in several European countries, such as: Germany, Italy, Netherlands, France, Belgium, United Kingdom, Sweden, Finland, Switzerland and other European countries. Besides this award, they have also won several awards from reputable organizations in the hosting industry and the detail can be found on their official website.